So you’ve decided to take up kayaking, but you’re unsure how to go about it. You’ve heard all the horror stories about people not being able to even get into the boat-like contraption, and you’ve heard about people tipping over mid-trip; while you want to learn, you definitely don’t want that to be you. Though mistakes do happen, they’ll be very unlikely as long as you take your time and learn the basics of kayaking. Here are a few tips to help get you started. Kayaking is a very popular sport. There are pro shops and sporting good stores all over the place that specialize in kayaks and kayak lessons. It won’t take you too long to get the hang of it, and if you have a professional teaching you, you can rest assured you’re kayaking as you’re supposed to. Kayaks come in all shapes and sizes, from sea kayaks, to river kayaks to white-water kayaks. And then they come in different lengths and widths for all of those types. 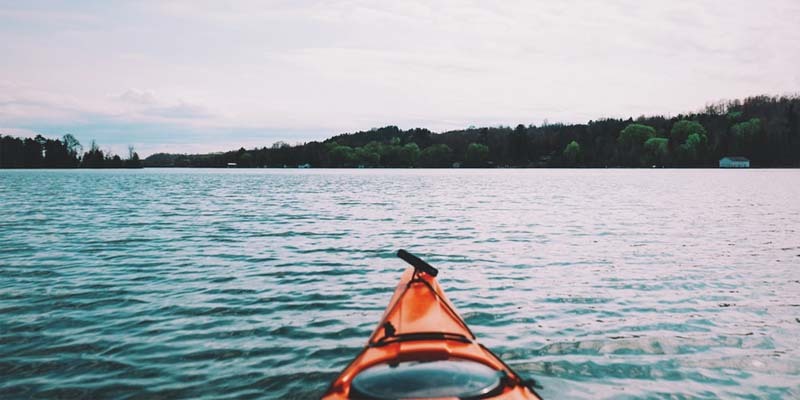 This is another good reason to see a professional: they have a depth of knowledge and will be able to help you choose a kayak that suits your body and your kayaking destination. Having the right size kayak will increase your comfort on the water, and will help speed up the learning process. We cannot stress this enough. You never know what is going to happen. Even if you’re the world’s best kayaker, you cannot predict the weather, or the water. Storms can roll in suddenly, motorized boats can rush past, and giant waves can come out of nowhere, especially if you’re on the ocean. So, play it safe and wear a life preserver, no matter what. They even make special flotation devices for kayakers that don’t hinder your movement as much as a regular, vest-style PFD would. Your immediate instinct is going to be to dress for whatever temperature the weatherman has predicted for your excursion, but you should also take the water temperature into consideration. Make sure you’ve got quick-dry clothing on, and some sturdy strap-on sandals or water shoes to protect your feet from rocky lake or river bottoms. If you’re a beginning kayaker, and even if you’re experienced, it’s not a very good idea to kayak by yourself. Always go with a buddy, most especially if it’s one of your first times out. This way, if anything goes wrong or you need help, you’ve got someone who’s accountable for your well-being, and so do they. Though it’s very unlikely that you’ll capsize on the calm inland lakes of Michigan, it does happen. You should know how to get out of your capsized kayak, be able to flip it over, and get back in. Many kayaks are equipped with pumps to get rid of excess water, as well as flotation devices that you can inflate if you tip, to stabilize your craft before getting back in. It can be scary to capsize, but you should know that in these situations, gravity usually takes over, meaning that if your kayak tips, you’re likely to fall right out as it flips over. It’s just good to know the procedure in case. Kayaking isn’t a difficult sport to pick up, and it can be very relaxing once you get the hang of it. Remember that no one’s perfect at anything on the first try, so if you feel like you’re not doing as well as you’d like, don’t get frustrated. Just like any sport, kayaking can take a bit of practice to get really good at. Take your time, go at your own pace, and enjoy it!